NOTE: The website of John Kleinbauer is no longer functional. My introduction into the hobby of desktop CNC was buildking a Kleinbauer Brute. I looked over several sets of plans and ideas before making a choice. My main interest is in making prototypes of circuit boards. As I have gotten older, point-to-point wiring on perf board just takes too long and is often prone to mistakes. I actually bought two sets of plans and have only built the Brute thus far. I thought the project could be assembled in time to use with my senior project as an off-campus student of South Carolina State University (attending classes at The University Center of Greenville, South Carolina). Boy was I was dreaming! At the time this page was created (Jan 2009) I had over 30 years of field repair experience in the medical imaging business. Building Desktop CNC system marries together all the sub-disciplines I have used in my career and education. Kleinbauer calls his stuff "Garage CNC" - You may already have more than 50% of what you need in your junk pile. Small size - You could integrate the control electronics and Brute into a small cabinet. Flexible/adaptable dimensions - You can fiddle with the dimensions and upscale this...to a point. 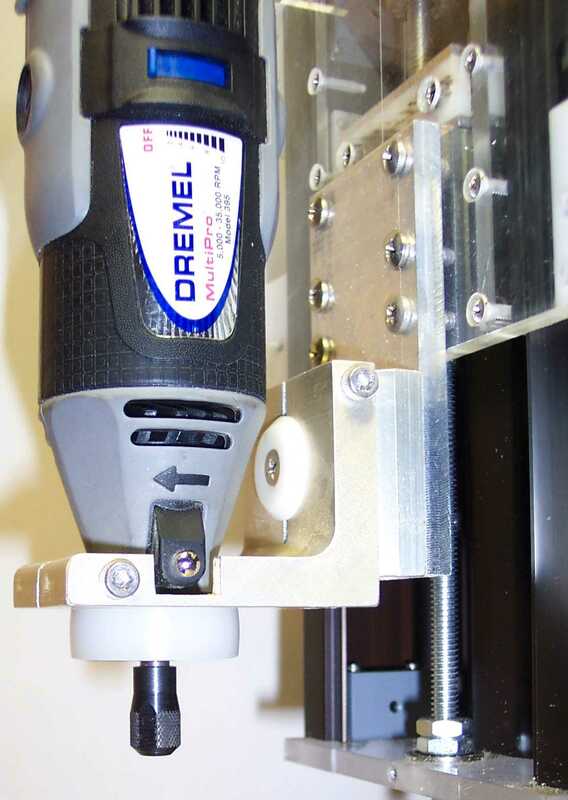 Flexible/adaptable drive system - You can upgrade the drive threaded rod to regular motion control products. The aluminum window channel used for the axis guides may be hard to find. It is also prone to flexing or non-perpendicular alignment. There are LOTS of holes to drill and tap. Unless you have a drill press this is a difficult part of the fabrication process. There are lots of parts to fabricate and assemble. Can anyone do this? Sure, with assistance. There are many, many things to consider when building a system. You are trying to build a working computer controlled system to move a tool in precise increments and motions to change a piece of raw stock into something useful of more value than the raw material. CNC Zone - Waaay more than you can imagine! Digital Machinist Magazine - A great magazine!